Coloring for relaxation is all the rage now. Handwriting can provide the same reward, and stimulate the brain in ways that typing simply does not. It can also be a meditative practice. Have you noticed that we are writing by hand less and less these days? Sometimes it’s just a signature with a blunt stylus at the grocery store, or your finger signing crudely on a credit card pay screen. Handwriting certainly looks like a dying form, as we type away merrily on our keyboards, responding to emails that fly off in all directions. Is this withering away of handwriting a problem? Or is it the inevitable unfolding of language forms evolving over the centuries, from oral to written to printed, and now electronic? Before we dash headlong forward, let’s slow down for a moment and consider the role that handwriting plays. I believe that handwriting still serves a deep purpose in our lives and that letting it fade away will be a loss to our spirit. Precisely because it is no longer essential for communication, handwriting can now be free to express its true nature as an embodied practice of creative expression, a synchronization of mind and body. Handwriting need not fold up and die. It can rise again as the original artistic act, unique to each of us, available to all, and really close at hand. Handwriting is one of humanity’s most amazing and most influential inventions. It is rooted in artistic representation— images etched in sand, rocks, and walls that eventually morphed into letterforms. When we write by hand, we are still performing that ancient act of using our hands to recreate what’s in our minds. Before writing, humans made marks. They were drawn in the sand, painted on cave walls, carved on rocks. The making of these marks grew out of a deep desire to connect with the power of the world. By drawing the tree, the bison, the moon, an understanding occurred, an energy touched. (Anyone who draws is familiar with this.) Our alphabet evolved out of these drawings—of an ox, a fish, a hand, a hook, a house, a cave. These forms were passed along, the original images becoming simplified in the handling. 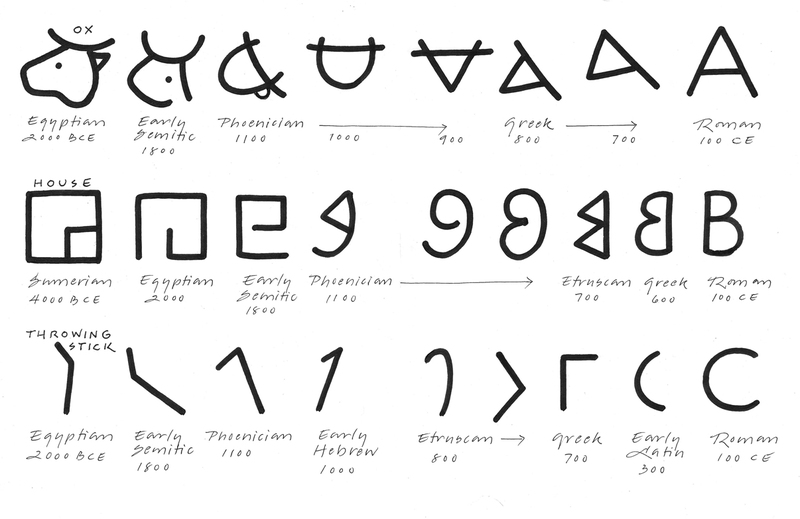 By 1200 BCE, an alphabet of 22 letters emerged with the Phoenician traders and evolved over time into the Roman letters. This syllabic system was efficient for commerce. It also remained a magical portal linking the inner voice with the outer world, bringing thoughts into form through the movement of the hand and stylus on the page. A recent article in the New York Times (“What’s Lost as Handwriting Fades”) described a study at Indiana University where children who had not yet learned to read or write were asked to draw a letter freehand, then trace it from a dotted outline, and then press the correct key on the computer. The researchers were amazed to see that the brain activity from the freehand drawing action was stronger, firing off in three different areas, while the tracing and typing motions barely stimulated the brain at all. The article went on say that apparently children who handwrite are able to generate ideas more easily, and that older students seem to retain information better when they take lecture notes by hand. There is something about the messiness of writing, its variable nature, that wakes us up, fires the synapses, brings us to the task at hand. That ancient way of understanding the world through drawing is still at work in the process of handwriting. It turns out it’s the imperfection and changeableness of how we write that sparks our creative flow. Whether you enjoy your handwriting, or are embarrassed and uncomfortable with it, getting on the page each day with some “slow writing” can open your channels of creativity and keep them humming. This is not about improving your handwriting, anymore than meditation is about improving your character (though both may happen as a side benefit!). It’s a practice of seeing ourselves through how we write, allowing our handwriting, and ourselves, to be unique, quirky, imperfect—and appreciated. When I write by hand I come under the spell of the forms and the magic and mystery of who I am and how I show up in this world—the confused, shaky self, the graceful easy moments, or the part that doesn’t know what to say next. The letters are the marks left behind, the tracks of my inner journey through this life. When I write by hand, the familiar shapes tumble out and make new combinations. But it is something about the physical act—the holding of the hand and pen—that is meditative, bringing me into the present. The body sensations are the foundation—the ache, the touch, the softness of the paper. The moving line is the breath that keeps flowing along. And the words that show up on the page are the thoughts taking shape, the weather appearing on the horizon. It is this physical aspect of writing—the sitting down and listening through the body, the hand, the pen—that can bring forth something substantial and true. Each shape, each word, is an expression of how the world is living in me. When I write by hand, I keep going all the way to the end of the page, enjoying the sensual touch of it all, the way the letters link and dance and skip along, my fingers waiting expectantly for the next pulse, the next wave, the next thought showing up, ready to be described. Handwriting is the reporter, giving form to it all, grounded in the past, amazed and present to this moment. I’m not suggesting we abandon our computers and return to pen and paper. (Though taking the time to write a thoughtful handwritten letter can be a really nourishing activity.) I’m as involved as anyone with the ever-expanding web of information. What I am proposing is that handwriting can become a contemplative practice, a generator of insight, a deepening down activity that counterbalances the vast, rapidly moving electronic world we’re bathed in. 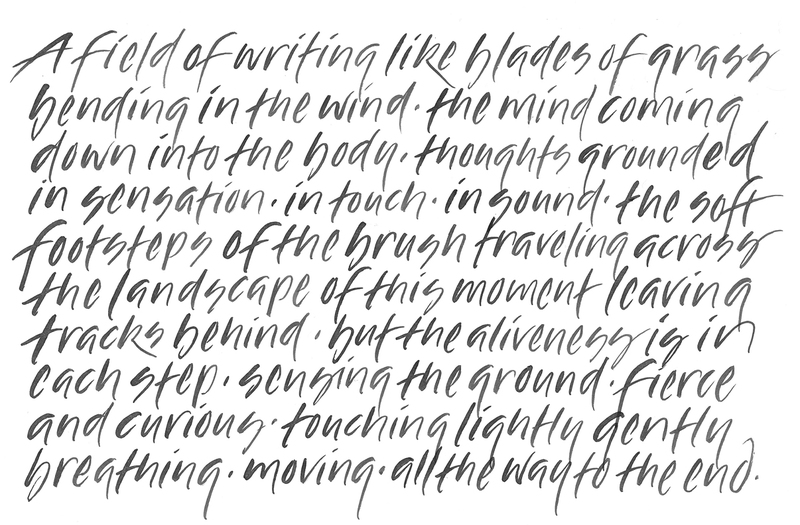 Handwriting is a powerfully simple way to bring natural creativity and connection back into our lives. It is an act of wholeness. Sit down with a couple sheets of paper in front of you and a pen that you like to write with. Feel your body, your fingers holding the pen, your hand resting on the paper, your arm ready to guide, your feet on the floor or your back resting on the seat. At the top of the page write the words, “When I write by hand,” and then notice what shows up in your mind next. It could be a memory from childhood of learning to write—or an aching in your fingers in this moment—or something about the sound of the pen touching, pausing, moving along on the page. Describe whatever it is, following the associations until you come to a pause in your thoughts. Write the prompt again, “When I write by hand . . . ” and head off, letting the words tumble forth, not concerned with making full sentences or perfect punctuation or spelling. Sit stable. Let your writing slow down. See how the forms change with this shift of speed. Notice how you’re feeling. Fill up two sheets of paper, or write for 10 minutes, then read what has come through. Where did you start? Where did you end up? You’re involved in an age-old act of bringing the loftiness of thought—what the ancient Chinese called “heaven”—down to the practicality of “earth.” Joining “heaven and earth” through human expression is the essence of art. Barbara Bash is a calligrapher, illustrator, author, and performance artist, living in the Hudson Valley in upstate New York. She has written and illustrated many books on natural history for adults and children. She teaches workshops in illustrated journaling, expressive brush calligraphy, and communication.